It's getting to be that time of year where the weather is warming up and days out in the sun and I don't know about you, but I typically drink mostly whites once warm weather hits, including rose', which I will cover soon in another blog. 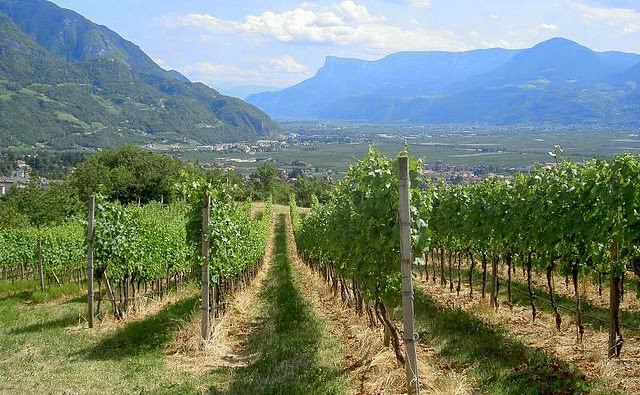 Today I'm going to focus on one of the regions that makes up the so called “Tre Venezie”, which include the Veneto, Friuli-Venezia Giulia and what I'm focusing on today, which is the Trentino-Alto Adige. Trentino-Alto Adige is located in the northeastern part of Italy. Trentino is in the southern part of this region with Alto Adige in the north bordering Austria. In this area you encounter multiple influences from the surrounding countries in regards to the language, food and winemaking. In this region there are influences from the Adige river, the second longest in Italy, that runs through the middle, the Dolomite mountain ranges and in the south near Trentino is Lake Garda. I'm going to break up these two regions this week and the grapes from them. There are a lot of similarities, but I think it's important to give each its own attention. We have plenty of time on this journey to cover everything. Alto Adige was part of Austria until 1919 and World War I when they handed it over to Italy, but the German and Austrian influences remained. Here the grapes resemble those of Germany since German is the primary language of this area and the names on the bottles are sometimes written in both Italian and German to make things more confusing. Just when you were trying to figure out what the Italian ones mean right? For example, Alto Adige is also written and known as Suditrol in German. There are a very high percentage of cooperatives in both Trentino and Alto Adige. 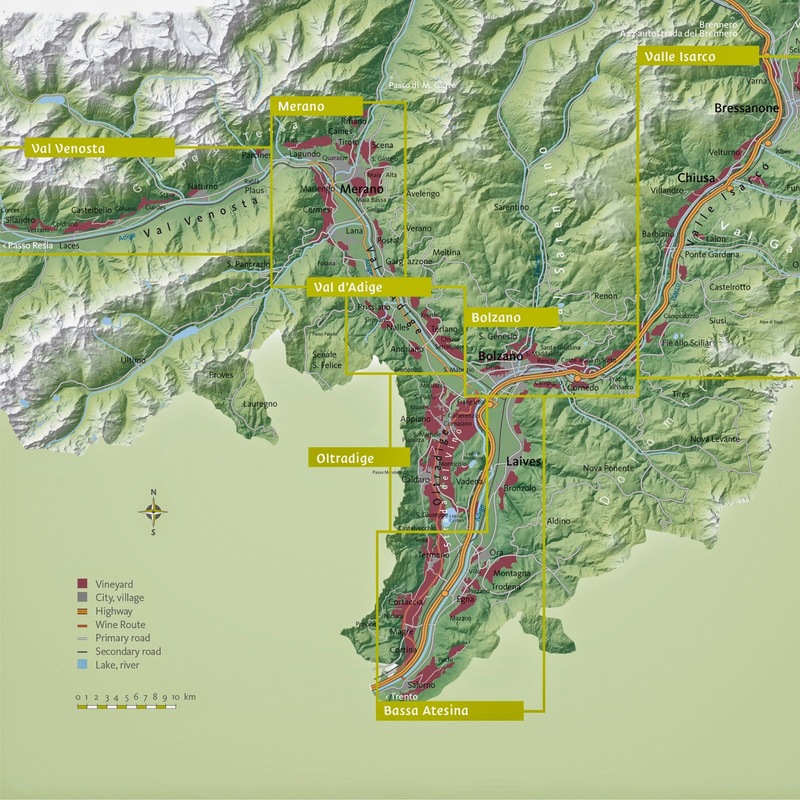 Most cooperatives in Italy have been driven by the government, but in the Alto Adige they were already producing wines when they were established so it's more driven by the producers of the region. Whites that are produced from Alto Adige include pinot grigio, pinot bianco, chardonnay, sylvaner, muller-thurgau, riesling and gewurtzraminer. This region also has many apple orchards so some of the wines like pinot bianco will display apple characteristics in the wine. Reds in this region are abundant though and you will find your international varieties like merlot, cabernet sauvignon and cabernet franc, but worth seeking out that you will be able to find in the states are some indigenous varieties like lagrein, teroldego and schiava, also known as vernatsch. If you want a vacation that is perfectly tranquil and where you will be surrounded with beauty you must visit this region. While you dream about monstrous Alps hanging over many of the vineyards, grab a bottle and a glass to help put you there in the meantime. As always I love to hear of your explorations so please share.